It's easy to be distracted by the extreme examples of any movie genre. Action movies are getting louder and more explosive. Dramatic pieces tend to involve a lot more shouting or more debilitating crying over disasters. Comedies hit both high and low in an effort to get a laugh for any reason. And all that can be a lot of noise and result in a lot of crappy movies. Then every now and then you get something that's just poignant and almost distinct because of its relatively understated nature. And that's how I feel about Sing Street as a movie experience. This is not an in your face musical but music is certainly at the center of its story. It doesn't feature well-known faces but it does have quite endearing talent involved. At its core it's a simple story about young love. But then it's also so much more and how it all comes together is what makes this such a special movie. My only regret is that it took me so long to get around to watching this movie despite sporadic social media mentions praising it. 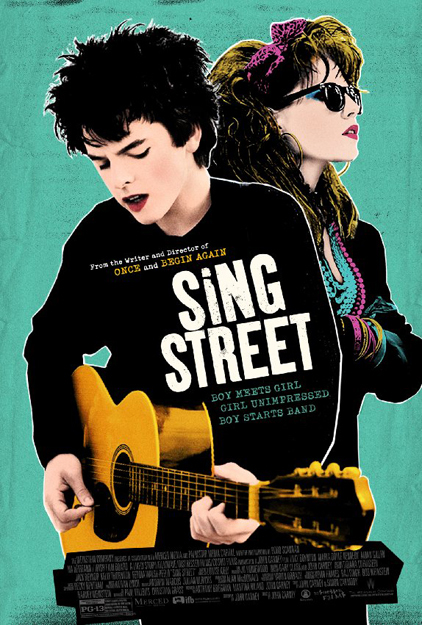 Synopsis: Sing Street is a 2016 musical drama movie co-written, co-produced and directed by John Carney. The movie premiered at the 2016 Sundance Film Festival and was nominated by for Best Motion Picture - Musical or Comedy at the Golden Globes among other awards. 1985 Dublin - young Conor (Ferdia Walsh-Peelo) is told by his father that he is to be moved to Synge Street CBS, a Christian Brothers School, as the family needs to save money. His first few days are rather difficult as he doesn't have the regulation uniform and runs into trouble with the principal a few times. But despite lacking the money to get the proper shoes, he eventually finds a creative solution to things. The big shift is when he encounters aspiring model Raphina (Lucy Boynton). He tries to impress her and tells her that he has a band and they need a model for their music video. She agrees, but then of course he doesn't have a band and so works with his first new friend at the school Darren (Ben Carolan) to put a crew together. They eventually meet the musically talented Eamon (Mark McKenna), who seems to be able to play just about anything, and it becomes realistic for them to actually have a band. What I Liked: Obviously the music is the biggest part of all this and it's quite brilliant. The songs aren't just great but also represent the various musical influences the boys encounter. And this is where the time-place setting really shines as it's not just songs of a similar melody and style but also a shift in how they dress and present themselves. The various shifts over time and their various outfits are a reason for delight time and time again in this movie. And then you have Ferdia Walsh-Peelo, who is an adorable actor and quite the charmer. And his portrayal of a young boy in love with a girl and also with his music is so earnest that it rings of sincerity. And that makes the movie all the more emotionally powerful. It's a simple story but told quite well. And that's what makes things great. What Could Have Been Better: The understated nature of the movie still means there are some slower points that feel like a bit of a drag at times. So when the kids aren't working on music or exploring possible romance, there are a fair number of bits that felt a little awkward. Often they were related to the family background stuff that, while important, could have been presented better. The angle of the conservative school felt a little out of place or somewhat extraneous to things. It felt like an unnecessary complication for the characters that would be more at home in Footloose and was probably derived from there. But these are all nitpick s really and not major things that get in the way of the movie as a whole. TL;DR: Sing Street is an adorable little movie that celebrates young love and the love of 80's music. It's a simple story dressed as an homage to a different time that triggers all the right feels. Thus the movie gets a fun 5 outfits the boys wear to pay tribute to their latest musical influence out of a possible 5.